Regular school hours are from 8:00 a.m. to 2:30 p.m., dismissing every first Monday at 1:00 p.m. Parents will be notified of any changes in dismissal times. Children are not permitted in the building before 7:30 a.m. unless prior arrangements have been made. In the event of weather-related closings, radio stations WGR and WKBW will announce closings at approximately 7:00 a.m. If the Lackawanna School System is closed, OLV School will be closed. Textbooks from grades one through eight is only partially provided through Federal Government funds. A series which is chosen in a given subject is used as long as five years, therefore, it is essential for each child to handle his/her books properly. Please see to it that each hard covered book is covered, preferably with a water repellent material. No sticky transparent covers are allowed. There will be a charge for a lost or damaged book. The school is required by law to conduct fire drills and other types of emergency drills, lock downs and lock outs, within the course of the school year. Exit routes are posted in each room. If it should be necessary to close the school because of weather conditions or other emergencies, an announcement will be made over local television stations and a message will be sent to the home phone, cell phone and/or email account listed on a student's file via the School Reach Instant Parent Contact System. OLV School has a well-equipped automated library. The goals of the library volunteers are to encourage and reinforce good reading and research skills and to provide reference materials which serve the needs and interests of students. There will be a charge for lost library books. Students are to be courteous to our librarians. The major objective of the religion course at each level is to have the children realize that "living" their faith is of more essence than merely learning the facts of religion. Besides factual instruction of Religion, the Teacher attempts to foster a praying community within the classroom. Students help prepare readings, responses and songs for Masses and Prayer Services. The cooperation of the Parents, Teachers and Students is essential especially for the Sacramental Program. Each student is assigned a locker or cubby in which to store clothing, lunches and textbooks. In order to maintain a quiet atmosphere for classes, students are allowed to go to lockers only at specific times. The school reserves the right to inspect lockers/cubbies at any time. Lockers may not be decorated on the outside. The required uniform for OLV School is mandatory. If a student violates the uniform rule, a verbal warning will be given. If this practice continues, parents will be notified. No uniform is required for Pre K.
The purpose of the uniform is to teach self-discipline associated with personal hygiene and grooming and to encourage student pride. Students are expected to be dressed in clean, properly-sized clothes. All uniforms must be purchased from the Flynn & O'Hara Uniform Company. Order forms are in the office. Girls (Gr. 1-4) - Green plaid jumper, khaki slacks/shorts, white cotton Peter Pan blouse or uniform shirt with the school logo. Girls (Gr.5-8) - Green plaid kilt, khaki slacks/shorts, white oxford blouse or a uniform shirt with the school logo. ***Please be conscious of skirt/jumper length. We are implementing the "FIVE FINGER RULE." No skirt or jumper is to be shorter that five finger lengths above the knee. Lengths will be checked. Boys - Green or khaki slacks/shorts, green or white shirts with school logo. Boys in Grades 5-8 may wear white oxford shirts. White or green sweaters are allowed as well as the school sweatshirt. No sports sweatshirts are allowed. Belts are to be worn with all slacks/shorts. Shirts and blouses are to be tucked in. White, beige, brown or green ankle or knee socks, tights/nylons are to be worn. NO PED OR LOWCUT SOCKS ARE ALLOWED. Socks are to cover the ankle. Uniform Shorts may be worn during the months of September, October, May and June. No colored, tinted or bleached hair is allowed. Radical or trendy styles are not allowed. Boy's hair should not touch their collars. Boys and girls should not have hair covering their eyes or hanging in the face. If earrings are worn, only one stud will be allowed. ABSOLUTELY NO HOOP EARRINGS. Jewelry should be school appropriate and approved by the principal. EYE MAKE UP IS NOT TO BE WORN. Silly bands will not be allowed. A separate outfit consisting of gym shorts and a plain white T shirt (with sleeves) may be worn under the uniform on gym day ONLY but must be changed after class. Children in grades 3-8 may change in the locker room. Most students will be able to follow the school's regular program of Sequential Learning. However, testing diagnosis, maturity level and actual performance may indicate that some students cannot complete a year's work in that time; therefore, it may become necessary to retain a pupil an additional year in a particular grade. If any student has difficulty doing an assignment he/she is required to meet with the teacher prior to the first class. If no excuse is presented and the work is not handed in, a failing grade will be given. Parents of junior high students will receive written notification immediately if homework is not completed. If this situation is not corrected, detention will be given. Positive parental reinforcement and support is essential for continual growth. Since students have different capabilities and interests, it would be difficult to denote the specific amount of time to be spent on an assignment. If a problem arises, the teacher should be contacted. If a child is ill for one day, homework will not be given unless requested by a parent by 8:00 a.m. When a child is out parents may pick up the work from the office/aftercare between 2:45-5:00 p.m. Schoolwork will not be given for children going on vacation. The student can make up the work in a timely manner after returning to school. In order to insure that all communication from school reaches home in a timely manner, Our Lady of Victory School uses a Wednesday Family Envelope system. This envelope should be emptied at home and returned to school the next day, along with any forms that need to be returned. There is a $.50 replacement charge for envelopes that are lost. Testing is essential for evaluating a pupil's progress. Various types of testing at different grade levels are used at OLV School. The Iowa Test of Basic Skills is scheduled for Grades 2, 3, 5, 6, and 7. This test measures the student's abilities in Math, Science, Social Studies, Reading, Language Arts and Reference Skills. Each year the New York State tests are given to Grades 4 and 8 in various forms. In Grade 3 and 6 a Diocesan Cumulative Knowledge Assessment in Religion is given. In addition to standardized testing, students are evaluated periodically by Teacher testing. Any student in grades 7 & 8 meeting the requirements may be exempt from June exams. Achievement of a 95% final average in the subject. All assignments must be turned in on time. No extra credit assignments can be used to enhance grades. Conduct and effort must be satisfactory. Exemptions may be taken away if the teacher/principal feels requirements were not met. The State of New York mandates that pupils participate in a program of Physical Education. 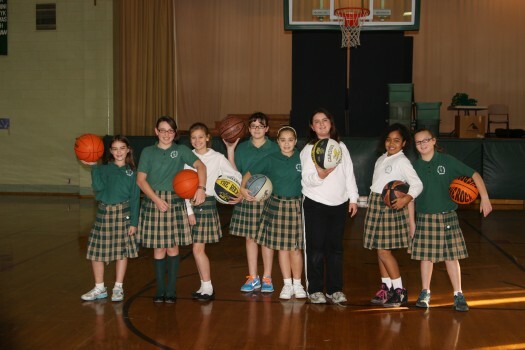 Classes are scheduled weekly at OLV School and involve games, exercises, physical fitness and instruction in rules of team sports. If there is a genuine medical reason why your child cannot participate in the physical education program, a Doctor's written statement to that effect is necessary. This excuse must be presented to the Principal. The policy of discipline at OLV will be compatible with the concepts of a Catholic Christian Community and the philosophy and mission of our school. The essential parts of our discipline policy are teaching the students a sense of respect, truth and responsibility for their own actions and the effect their behavior has on others. This policy MANDATES the cooperation of Parents/Guardians and Students with school personnel. The Food and Drug Administration forbids any Laser Pointers to be used by students in school, therefore, they may not be brought to school. Continued misconduct will result in the loss of privileges at all grade levels. Gum chewing will not be tolerated and will be dealt with according to teacher discretion. Our regulations regarding these infractions will be enforced on the school grounds, in the school building, on the school bus and during all school-related activities. It is the policy of Catholic Schools in the Diocese of Buffalo that all students have the right to be free from all forms of discrimination, including sexual harassment, in the school environment. Sexual harassment does not refer to behavior or occasional compliments of a social nature. It refers to behavior which is not welcome, that is personally offensive, that fails to respect the rights and dignity of others. All claims of sexual harassment will be thoroughly and immediately investigated by the administrator. The disciplinary action taken with respect to each violation of this policy will be determined in accordance with the seriousness of the particular offense and may include written warnings, parent conferences, mandatory counseling, suspensions, dismissal or a combination of actions. Schools in the Diocese of Buffalo do not condone and will not tolerate any type of unlawful harassment. IT IS THE RIGHT OF THE ADMINISTRATION TO MAKE THE FINAL DECISION IN DISCIPLINARY MATTERS. Schools within the Diocese of Buffalo Catholic Education System believe that student attendance in school increases student success. In order for each student to develop their personal talents, pursue academic quality, foster responsibility and leadership, we encourage parental support in the educational success of children. Regular attendance at school is essential for student success. Subjects are taught in sequence and require the understanding of each concept in the order of its presentation. Therefore, students who miss 30 days of school, and have not met periodically with school administration, are in jeopardy of retention. At a conference with the school administration and teachers, alternative educational plans will be determined. It is the parent/guardian's responsibility to notify the school administration of an attendance concern and to request such a conference. School calls parents if parent has not called. Students who are tardy must report to the office. A written excuse must be completed by the parent/guardian giving specific reason for absence/tardiness within 3 days. Unexcused absences/tardiness are recorded in the school register of attendance. A note should be submitted to the school office when a student is going to be released early. A parent or guardian must come to the school office and sign out the student to be released. To set rules, times and limits so that your child gets to bed early on school nights, arrives at school on time and is picked up on time at the end of the day, is dressed according to the school dress code, completes assignments on time and has lunch money or a nutritious sack lunch every day. To actively participate in school activities such as Parent-Teacher Conferences. To see that the student pays for any damage to school books or property due to carelessness or neglect on the part of the student. To read school notes and newsletters and to show interest in the student's total education. To support the religious and educational goals of the school. To support and cooperate with the discipline policy of the school. To treat teachers with respect and courtesy in discussing student problems. Our Lady of Victory School admits students of any race, color and national or ethnic origin to all the rights, privileges. Programs and activities generally accorded or made available to students of the school. Our Lady of Victory School has developed an attendance policy in accordance with New York State Education Law Section 3205. This comprehensive attendance policy will help to uphold the mission statement and philosophy of our school. School begins at 8:00 a.m. Every student MUST be in his/her classroom at this time. If a child shows a pattern of frequent tardiness, parents will be contacted for a conference. If your child is going to be late due to an appointment, please call the school secretary by 8:00 a.m. If a child is tardy five days he/she will not be eligible for Perfect Attendance. No children will be allowed in school before 7:05 a.m. If anyone arrives before 7:40 a.m., he/she must have a book to read while waiting to go to the classroom. Parents are not to walk their children to the classroom with the exception of Pre K.
Available until 5:30 p.m. The first forty minutes will be dedicated to snack and independent work (e.g. homework, reading, coloring, etc.). After Care bills should be paid weekly. An additional fee will be charged if children are not picked up by 5:30 p.m.
A school nurse will be available. The City of Lackawanna provides this service. Parents must be alert to the New York State Immunization laws for school children. A school aged child may be refused admission if the health department uncovers his/her incomplete health record. Consult your physician so you child's health profile is kept up to date. Medicine to be dispensed to a child must be accompanied by an Authorization Form, available in the office. Parents must sign a request for school personnel to administer medicine. All medicine must be kept in the nurse's office or school office. If your child is ill, please keep him/her home. If he/she becomes ill at school you will be notified to pick him/her up as soon as possible. It is imperative that we have an emergency phone number of someone who will accept this responsibility for you if you cannot be reached. We do not have adequate health personnel to care for sick children. Be aware that all children are susceptible to pick up illness. Every child participating in the sports program must have an athletic physical. This must be updated every year. In general, pupils are not permitted to leave the school building during school hours. A child may be released from school only to parents/guardians or persons authorized by parents/guardians. Under NO circumstances shall a child be released from school to an unidentified person. Parents/guardians and authorized persons only are to report to the School Office to pick up children to be released. If a child is leaving school early or not returning home in his/her usual fashion a written note explaining the situation must be sent with the student on that day. Please be advised that children being picked up after school must be called by the office staff. NO parent should go to the classroom to pick up their child/children. Dismissal of picked up children is 2:30/2:35 p.m. Those picking up children are to remain outside and the children will be sent out. This is important to observe so an orderly dismissal takes place. Students not picked up on time will be sent to the After School Care Program and parents will be charged the daily rate for using this program. Absolutely NO radios, CD players, headsets, iPods, MP3s, Game Systems, cameras or personal electronic devices of any kind are allowed in the school without permission of the Principal. Violation of this rule results with a $5.00 fine and confiscation of above articles. NO skateboards or roller blades allowed. If cell phones are to be brought to school, they must be turned off and placed in a receptacle in the office where they can be picked up after school. NO cell phones are to be left in backpacks or taken to the classroom. This program develops the whole child. It includes readiness skills as well as social interactions. This program provides developmental experience for the children with special needs. The pastor should be notified immediately. Parents/Guardians should be notified. The student committing the violation should be placed on out-of-school suspension, which could lead to expulsion pending further investigation. This will be at the discretion of the Principal. A conference with the parents/guardians and student should include a written statement by the principal and possible consequences pending further investigation. All parties must sign the statement. The police will be notified. A letter of explanation to all school parents/guardians will be sent home if deemed necessary.